I think of my own father, Herbert, who also was the father of four. His wife died at age 33, of leukemia, just a few months after the diagnosis. Dad was left to raise four children under the age of 7 all by his lonesome. How do you survive that gut punch, that heartbreak, that total meltdown of your world? In many ways, my dad never did fully recover. But he did the best he could. We moved from Jersey City, NJ to Hagarville, Arkansas – from the big city to the tiniest speck on the map in the foothills of the Ozarks. “Culture shock” doesn’t do it justice. However, it was a great place for us to grow up with a single parent, and has made my life experiences richer. We were dirt poor, but our dad bestowed gifts upon us that were priceless: kindness, integrity, compassion. Herb passed away in 2010. I miss him every day. To anyone who has lost a father, this beautiful song by Billy Bragg is for you. And to add a bit of “bonus footage” to the rerun, there’s another great song about missing your old man below. 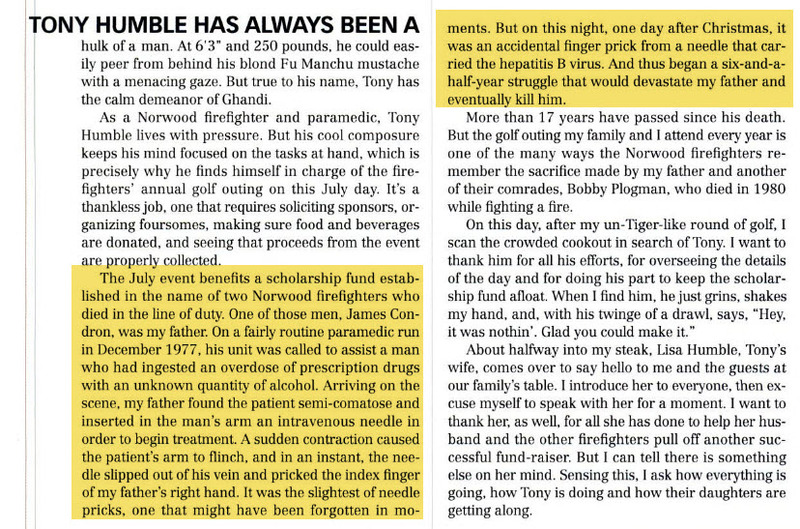 My friend Tim Condron (check out his Second Takes blog) lost his father, a Norwood, Ohio firefighter, while we were in college together. His dad contracted Hepatitis B on the job, while coming to the aid of an overdose patient. (You can read the entire article Tim wrote for Cincinnati Magazine here.) Tim and I took several classes together at Xavier, as we were both communications majors. Shortly after his father passed away, Tim put together a video of still photos of his father with this song as the soundtrack. It was one of the most moving pieces I’ve ever seen. Here’s to you, Herb and Jim, and all the other good dads who are no longer here, yet always present. D2, my brother, you are a good man. Herb would be very proud of you. I was thinking of my Dad this past Sunday, when I was cutting grass. I was thinking back on some random moments thinking the same thing…he did the very best he could. I’ve always said, I’d be doing an okay job if I end up being half the father he was to me. Herb and Jim did a damn fine job, in my estimation. Keep up the good work, brother. And thanks for the shout out. Let me know when you’re ready for our dads-and-husbands-who-always-wanted-to-be-successful-writers-but-put-more-emphasis-on-our-roles-as-dads-and-fathers-to-the-potential-detriment-of-our-writing-careers support group get together. Peace, my man. And happy birthday, Herb! Thanks TC, I know your dad left this earth way too soon but he also left an amazing legacy. We’ll hoist one to Jim and Herb very soon.